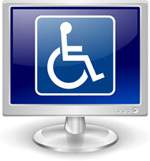 Web accessibility is a means for people with some kind of disability to use Internet. With web accessibility, people that have disabilities are not only able to work on the Web, but also are able to perceive, understand, navigate and interact with the Web - and even contribute to it. By following some basic accessibility standards and guidelines, each of us can make sure that our website content is more accessible to those who might have trouble using it. Conditions that adversely affect physical, visual, auditory, neurological and cognitive ability should be considered whenever accessibility is being mapped out. It also assists people with changing abilities because of age. When we talk about disabilities we also mean temporary disabilities which affect the use of the Web. This may be anything like a fractured arm or an injured hand which can prevent someone from using the Internet properly. Millions of people in the world have disabilities which can affect their ability recieve the full benfit of what the Internet has to offer. There are many hurdles to overcome when creating a website that will truly be accessible to anyone. Depending on the content of the site it may be impossible to meet the needs of every user, and if that is the case it becomes necessary to identify efficient ways to meet the needs of as many users as possible. The following information provides high level overviews of many conditions that should be considered. See "Why Bother With Web Accessibility?" for reasons why web accessibility is important. Visual disabilities may include blindness, low vision or color blindness. Many individual who are blind use screen reader software that reads the text on screen or refreshable Braille display. People with low vision use extra-large monitors while others use screen magnifying software to make the text legible. People with color blindness use their own style sheet to change the text and the background color used by the author. It may include weakness or the limitation of muscular control. Some disabilities adversely affect movement. These conditions often affect the legs or arms. Web accessibility also needs to be a concern when dealing with auditory disabilities such as deafness and other hearing impairments. Web content is evolving from simple text and visual graphics into video, audio, and other multimedia formats. However, for those that are deaf captioned audio is hardly accessible. Certain websites like federal government websites are required to have captioned video under the Section 508 Amendment to the Rehabilitation Act of 1973. Individuals that suffer from epilepsy or other seizure disorders may be adversely affected by banners or objects that oscillate at particular frequencies. It is important to offer users with these types of disabilities the option to disable animated objects and text that might lead to a seizure. These are the individuals with impairments of intelligence. These people have more difficulty than the average person with certain tasks. With the wide range of capabilities among users with disabilities, web accessibility becomes a complicated matter for developers. In some cases it may be impossible to make content accessible to everyone. 1) Content - Deliver alternatives to all audio and visual content that provides the same information or function. 2) Color - Make sure that color alone is not used to define information or objects. This will allow readers with color vision deficiency to easily understand all of the meanings conveyed in the site. 3) Code - Mark all documents with proper structural code elements. Site presentation should use style sheets as opposed to on-page attributes. 4) Language - When using foreign text or abbreviations be certain that the page code includes mark-ups that assist users with interpretations. 5) Tables - Make sure that the HTML used to set tables within a site can be rendered by all browsers and applications. 6) Technology - Using state of the art technology may cause errors in older browsers. Be certain the site is easily viewable. 7) Motion - Make sure that any objects that update automatically such as scrolling text or audio files can be controlled by the user. The media should be able to be stopped or paused, and volume should be easily controllable. 8) Interface - Keep the user interface simple and easily accessible. While it may be necessary to include complex design elements in the interface, try to keep them to a minimum. 9) Orientation - When complex elements must be used, provide alternative pages or content that can be served on request. 10) Navigation - Navigation should be easily accessible and consistent. For reviews, comparisons, and ratings of the major Internet Service Providers, check our left navigation or return to our home page.